Buckskin Boone, and all of the Ladies and Gentlemen Labs of the Desert Wind, wants to welcome you! 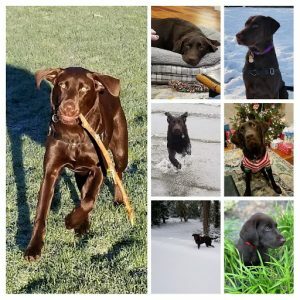 Desert Wind Labradors is located in Central Washington on acres and acres of fields and ponds that provide our AKC / CKC Labrador Retrievers with unlimited access for hunting, training and just plain fun! 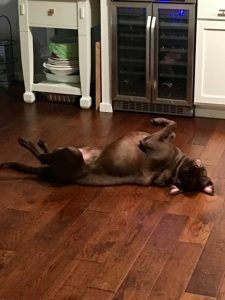 The core philosophy that guides our breeding program is to consistently provide the worlds finest Labradors through careful adherence to the AKC and CKC breeding guidelines plus incorporating the latest in genetics to continually maintain the finest qualities our clients have come to expect in our labs! 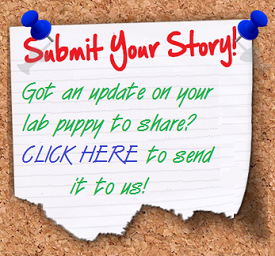 Truth is that our specialized breeding program is not the largest – nor is that our goal. However the results in the magnificent puppies that are produced on the Desert Wind are second to none world wide. Because we aim high in choosing the right parents that have only the very best qualities – superb body confirmation combined with only the greatest intelligence always looking for improving health and overall longevity. This is shown by the ability of our puppies to be trained early in whatever endeavor our clients choose – they make loving and devoted Family Dogs, they are enthusiastic with a highly developed natural love for birds and retrieving which develops into Hunting & Field Trial Champions, their intelligence and ability to learn new tasks quickly (not to mention their acute desire to please) make them excellent Service or Search & Rescue Dogs… They perform at the top of whatever field they are placed in. And Desert Wind Labradors is unique in that we seek to incorporate the longevity of our sires, dams and puppies through nutrition and genetic selection. Anyone who has owned a Labrador Retriever knows that the longer and healthier they live the better. We are committed to this even though it takes time and patience. It is our goal to produce dogs that are able to live to the full extent of their life expectancy. We believe that through consistent adherence to these goals we can eventually produce Labradors that will live into their late teens and possibly longer. And again we believe this is only possible through careful genetic selection and optimum nutrition throughout their lives. So whether you are looking for a magnificent yellow, a stellar black, an adorable chocolate or even the rare chocolate-nosed yellow (we call these White Chocolate) Labrador Retriever puppy, Desert Wind Labradors have just the puppy for you! Healthy, Happy, Well Adjusted Labrador Retriever Puppies that are handled from birth and ready to become your best friend and/or hunting buddy. All our pups come from carefully selected parents that exhibit and pass on in their offspring the gentleness, loyalty and dedication that exemplifies the very best of the Labrador Retriever breed and has made it the Number One dog in America for over 20 years..
Our labs are full spirited, enthusiastic, eager to please. They are quick learners and very easy to train… not nervous or high strung. Choose yellow, black, chocolate … they are all great! Plus we do offer the rare liver nosed yellow lab (or white chocolate) which is so unique you just have to see them to appreciate exactly how stunning they are! Desert Wind Labradors offers purebred AKC and CKC yellow, black, white chocolate (yellow with chocolate brown nose) and chocolate labrador puppies. 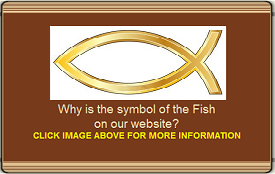 Below are examples of each color as well as the description of what you can expect. CLASSIC YELLOW LAB PUPPY The classic yellow coat color comes with the jet black nose (the black color will wear off with age) and black rim around the eyes. The variation in the coat can be extremely pale to overall golden wheat color. The overall body color can be solid color or show deeper shades on the ears and back. BLACK LAB PUPPY Almost without exception the labrador retriever to win the annual AKC holiday dog show is a black lab. 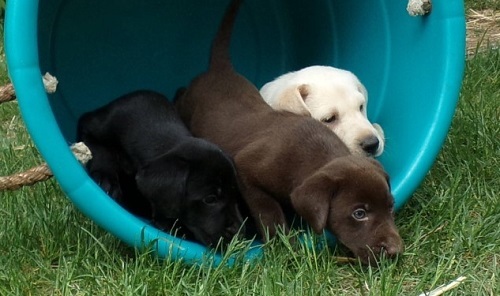 Blacks are also a favorite of many hunters who will not even consider another color when choosing their lab pup. Depending on which Geno-type they come from the Desert Wind black lab puppies can have the jet blue black hue or the black with deep chocolate highlights. WHITE CHOCOLATE LAB PUPPY The white chocolate lab puppy’s coat color can range from very pale with rusty colored rims on the ears to overall body color of deep caramel but what makes it a white chocolate is the chocolate brown nose and eye rims. This is only possible because of a recessed chocolate gene. 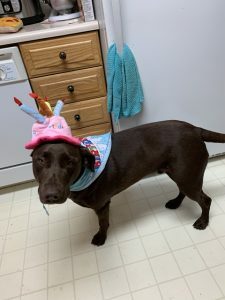 CHOCOLATE LAB PUPPY For those who believe a chocolate lab puppy is just a brown lab we have to break the news that on the Desert Wind chocolate lab puppies come in a variety of shades … milk chocolate, regular chocolate, cinnamon chocolate and dark chocolate. No kidding! Every litter offers choices and every preference can be accommodated.